That might sound a tad dismissive, but the more I thought about it, the more apt that simple description began to fit Halo 4. 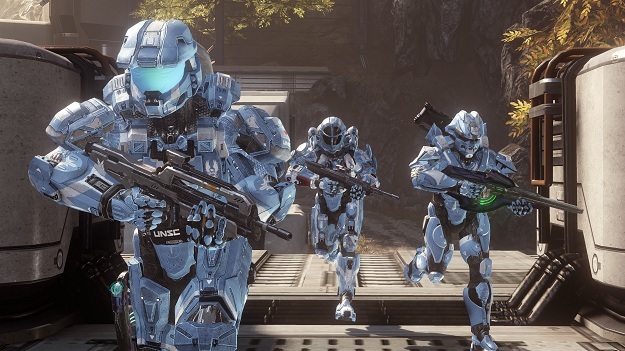 The biggest fear among fans about Halo 4 has been focused on the changing of the guard. Bungie spent years bringing the series to life, then closed it out before moving on to greener (as in more lucrative) multi-platform development. In its place sprang 343 Industries, a developer created specifically to make Halo games. This new studio announced that it would expand the series, bring back Master Chief, and even launch a new trilogy for good measure. But could the franchise – a franchise that only ever existed as the property of one developer – continue to succeed under a new steward? The thing about 343 is that it isn’t just a new studio tasked with continuing Halo, it’s a studio created from Halo developers excited to carry on the torch. Although Bungie as an entity moved on, many of the staff stayed behind specifically for Halo, so the game is in the hands of some of the most dedicated developers that you could possibly imagine. They know what they are doing, and they know how to do it. So did they manage to stay true to franchise even while refocusing it? Well, for that I refer you to my previous answer. Halo 4 is very much a Halo game. In fact, this is the most quintessentially Halo game ever. Each of the five previous Halo titles (not counting the RTS Halo: Wars or the remastered Halo: Combat Evolved Anniversary) pushed the series a little further each time, trying new ideas and gently nudging the franchise forward. None of the games strayed too far from the core values and mechanics introduced in 2001, but they all added new elements. Halo 4 cherry picks those ideas and offers them with a new set of graphics and a few new bells and whistles, but it does not stray from the formula. In any way. Halo 4 is quite possibly the “safest” big budget game ever made, barring annual games like Madden and FIFA. The game takes absolutely no chances at all. If it were a Hollywood movie, it would be a summer blockbuster, built to scratch using a well-honed formula, predictable to a fault, and yet still entertaining. 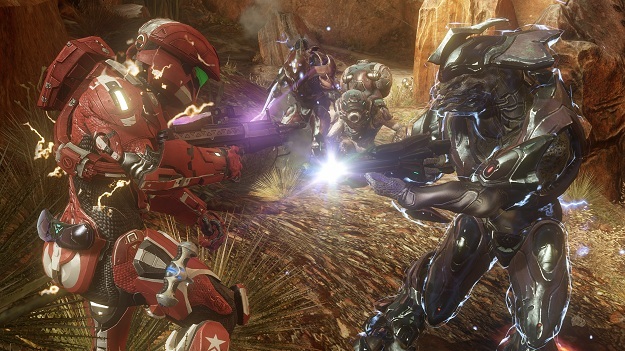 For while Halo 4 takes little to no chances, it really doesn’t need to. 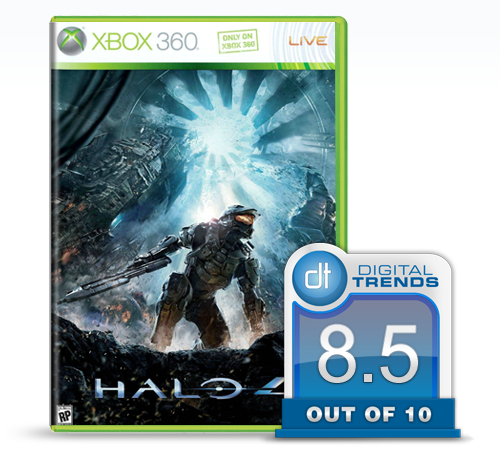 The formula 343 is using is a proven hit, and Halo 4 follows it admirably, perhaps even to a fault. Although the original story of Halo was concluded in a fairly decisive fashion, Halo 4 begins a new trilogy known as the “Reclaimer Saga” that starts nearly five years after the Human and Covenant War came to a conclusion. When we last saw our iconic, armor-clad hero he was a Master Chief-cicle, stuck in a cryogenic pod on a ruined UNSC ship, drifting above an artificial planet that you soon discover is named Requiem and was home to the Forerunners. Despite her own problems with “rampancy,” a condition akin to schizophrenia that AI go through at the end of their life spans, Cortana has remained vigilant, watching over Master Chief (and even upgrading his armor). When a rogue Covenant detachment arrives, the Chief is awoken and the fight begins. Once on Requiem, an ancient threat awakens and you are faced with a new enemy army known as the Prometheans, artificial guardians designed to fight the Flood. The Prometheans are taking orders from someone even more powerful though, someone with a grudge against humanity. The thing about the narrative of Halo is that the overarching plots of each game have always been great, but the details have been a bit meh. You have an interstellar war, a mysterious ancient weapon, an attack on Earth, a rebellion amongst the Covenant, and the tragic fall of a world. Those ideas are all solid, enough so that the series has spawned books, comics, and countless discussions of a possible Hollywood adaptation. But when you look closer, the details have always been handled a bit roughly. That problem continues in Halo 4, and is even exacerbated by having to introduce a new story within an established universe. Halo 4 doesn’t continue the Halo lore, it creates a new one that fits within the structure of the old. But it is not an easy fit. The main antagonist’s motivations are a bit muddled. His intentions are clear enough, but much of the history the game draws on requires you to accept it. You have to actively want to believe this new menace, otherwise it just feels a bit hollow. The previous games were a fight for humanity’s survival, this game is a fight to kill a guy that just really dislikes us. This isn’t helped by the lack of any real effort to try anything new either. The Halo franchise has spawned heaps of rich mythology, but Halo 4 mostly ignores it. The integration between this game and the Web series Halo 4: Forward Unto Dawn adds a bit of depth thanks to the crossover character of Lasky, but the majority of NPCs are background at worst and stereotypes at best. There isn’t even a moment given to the remarkable homecoming of Master Chief. The humans he meets that know who he is just sort of nod to the suddenly resurrected savior of our species, then go about their business, oblivious and unimpressed that they just met what is essentially Jesus with a particle weapon (and a violent streak). After years of Halo games, the past is barely ever mentioned. There is hardly even a mention of why the Covenant, which humanity is at peace with, is siding with your new enemy. This game is part one of three, so perhaps this was a deliberate choice to keep the greater context to a minimum. You’d think that they would expand the universe rather than be happy to just operate within it though. Thankfully, the gameplay makes up for that. Putting aside the lackluster campaign story, the gameplay within it is boss. It is the best of all Halo worlds. Master Chief’s movements are generally smooth and responsive, and each of the weapons has a consistency to it. When you are at your best, you can walk into a clearing, wipe out an entire troop, and leave feeling like a complete badass. There should be an explosion for you to walk away from without looking after every major encounter, just because. 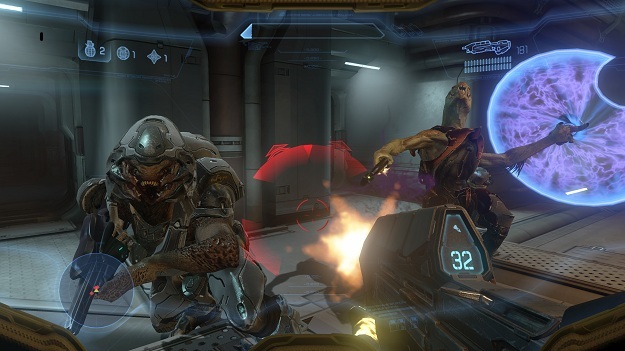 Halo 4 is a challenging game, and you can expect to die often. The Prometheans make tough enemies, but each battle has a flow, and learning the best way to make it through an area can feel like living out a John Woo movie – one of the old John Woo movies before Hollywood did things to him. To help you fight this new foe are a wide new variety of Promethean weapons… sort of. The new weapons are all fun to try out, but with a few exceptions they are just new takes on existing weapons. Promethean shotgun? Check. Promethean sniper rifle? Check. Promethean plasma gun? Check. And so on. There are some differences to the weapons, but not many. They are fun to look at and the reloading animation is cool, but none of them make even the slightest difference in how you play and could be removed without you even noticing. Armor abilities like the jetpack and decoy are back as well, but the most useful of these is a flying sentry you can call upon. Get it and hold on to it, and your life will be much easier. The gameplay is as smooth and slick as ever, and the weapons – new and old – operate as you would expect them to, giving you a good sense of what you need to do at all times. In other words, it’s Halo, and Halo at its finest. The Halo games have always looked good for their time, and Halo 4 has some of the best graphics around, especially in the cinematics. There are a few moments that make you question if you are watching live action or CGI, but these are brief. They are certainly a long way from weird facial animations and blocky bodies with arms that bend strangely. 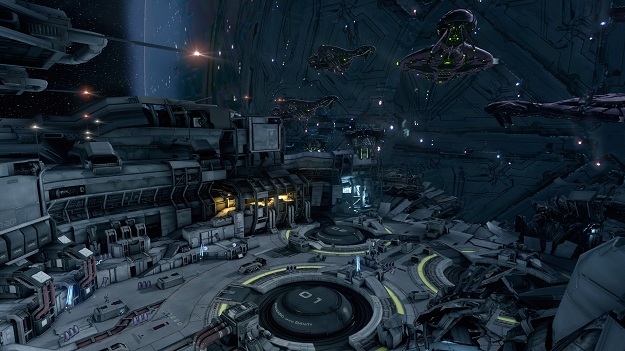 The levels looks great as well, but in typical Halo fashion much of your time will be spent fighting through what are essentially space warehouses, space canyons, and the like. After you see one corridor, you’ve seen them all. There are a few standout moments, but much of the game is somewhat unremarkable to look at. The game does occasionally pull off some great “OMG” moments, but they are scarce. Halo has always been about letting you run around and tackle enemies how you like, so that sense of guided spectacle through set pieces — as with games like Call of Duty that thrives on them — is absent. That shouldn’t be a surprise to anyone though. The levels blur together, but replaying them is about the battles, not the scenery. Adding up to three more players to join you either online or locally just further emphasizes this. Again though, that’s a tradeoff that Halo decided to make a long time ago, and the result is a game built almost entirely around gameplay. The thing is, Halo has always been built around multiplayer that somehow fooled itself into thinking that it was campaign-based. And really, the multiplayer is were Halo has always really thrived. New to the series is a multiplayer hub that exists within its own fictional corner of the Halo universe. The idea is that you are a Spartan aboard the UNSC Infinity, the largest ship ever built by humanity. The games you play are recreations, training you for the field and allowing you to customize your character as if your multiplayer avatar were part of the Halo world. While this is a decent enough conceit for the game, the thin, skin-deep integration will quickly make you forget it is even there. The competitive game modes you have come to know return (under the name “War Games”), as does the Forge, which includes even more creation options than ever before. If level design is something that appeals to you, the Forge’s upgrades are appealing. Your character can customize their look, loadout, and abilities by leveling up and earning credits, which allow you to buy things that are unlocked when you meet certain prerequisite levels. This style has gained momentum recently thanks to games like Black Ops. It doesn’t change the way you play, but it gives you more to strive for. Also new to the franchise is “Armor Mods,” which are basically perks that augment a stat or give you a particular boost in one way or another. There are eight to choose from (you select one per loadout), and they include things like a sensor upgrade, the ability to resupply off of fallen enemies, and faster reloading. One difference is the specialization option that opens up when you reach level 50. As with many other games, reaching the level cap opens up the possibility of starting over, but with a twist. When you hit this point, you can choose from eight options — two at launch, six to be introduced over the months via DLC. The two currently available are “Wetwork” and “Pioneer.” The Wetwork specialization gives you a new look as well as a unique stealth armor mod, while the Pioneer gives you a new armor (which is aesthetic only), and a different mod. You can then play through ten levels to unlock the next specialization, then the next and so on. It is a minor addition, but a good one. All of the modes, from Team Slayer to Oddball to King of the Hill are there, as are player-created levels via the Forge. Theater playback returns as well, and the 10 maps currently available — more are scheduled via DLC – are all well-crafted and designed to balance most styles. There will of course be favorites, but they all move well. 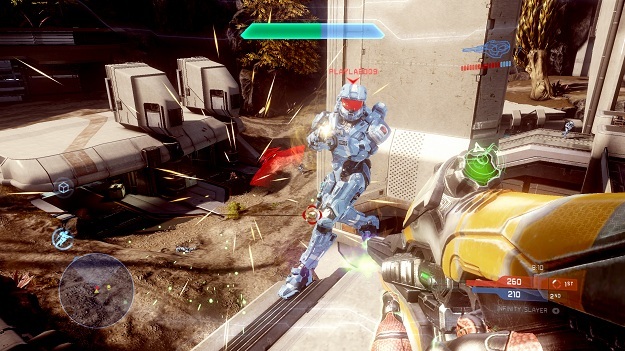 In every way, this is the traditional Halo multiplayer, with only a few minor tweaks. 343 takes very few chances here. It would have been nice to see the developer stretch to put its own stamp on the title, but the “if it ain’t broke” mentality ensures that it won’t be bad. While I have spent a good amount of time going over the similarities between Halo 4 and previous Halo games, there is one new feature that stands out and cannot fault to impress. The Spartan Op missions are introduced as a set of five missions, each with a bit of their own story line. These missions can be played alone or with three others, and you can select the level of difficulty to match your desire. Each mission can take anywhere between 10 and 30 minutes based on how you approach it, and the experience you earn counts towards all forms of multiplayer. Here’s the hook: Five new missions will be introduced per week at no cost. For 10 weeks straight. With the campaign clocking in around seven hours, that means when the Spartan Ops is complete, you basically have a second campaign to play that is longer than the first, and it evens adds a bit to the storyline for good measure. It is easy to look at the rest of the game through cynical eyes and see a formulaic approach to recreating a successful franchise, but these free, weekly DLC drops make you think that 343 isn’t trying to recreate Halo just for profit, they are doing it because they are massive fans. These Spartan Ops are a love letter to those, like them, that can’t get enough of Halo. Halo 4 is the very definition of a safe game. It takes no chances, offers very little new, but it does what Halo does best. 343 knows the series, and knows what makes it work. The story is uninspired and weak, but the gameplay makes up for it. Fans of the multiplayer will likely enjoy the fine tuning as opposed to a complete overhaul, and those new to the series will have to overcome that incredibly steep learning curve if they want to compete, but now is the time to see why Halo is so beloved online. Despite my issues with the lack of innovation, the core of what makes Halo Halo are intact, and the Spartan Ops make the game a huge value on top of that. If you are a fan of the series, or are looking for a first-person shooter to make you feel like a god among men, then look no further than Halo 4. Just don’t expect anything more.